My yard is brimming with food now always arriving in the hot, sultry, dog days of summer. I plant only what I can grow, nurture and produce successfully. I don’t want failure. Gardening takes a lot of persistent, dedicated, focused work. Preparing the soil, pulling weeds, watering regularly and picking the produce. But, it’s worth it, because the food just tastes so good. I’ve been growing food for more than 40 years starting in my parents Connecticut backyard. My first crop green bush beans was successful enough that I plant beans every year. It’s probably because I am spoiled by the immediate palate pleasure of my homegrown veggie rather than the days old, dull, drab, and sometimes even tasteless store bought version. (Fresh green beans at Thanksgiving are always disappointing!) 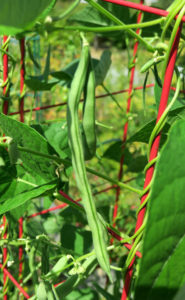 I now plant pole beans, rather than bush beans, since they produce for several weeks ensuring a steady supply of the crisp, succulent, slightly sweet, but also savory slender shot of yum! Moving to Massachusetts just out of college, I grew the standard east coast hot summer vegetables, tomatoes, cucumbers, and of course, green beans. The entire eastern seaboard is characterized by hot days with high humidity and occasional thunderstorms, driven by the warm, humid Gulf of Mexico air and high pressure systems in the Atlantic Ocean. New England is tempered from the most intense weather by the more northerly latitude sun angle, but still the summers are usually hot and humid enough to grow luscious fruits and vegetables. In 1985, I moved west across the 100th meridian or longitude line, where the climate changes from humid conditions to a semi-arid/arid climate, which roughly follows the western edge of the plains states of Kansas, Nebraska, and Dakotas and actually forms the eastern border of the Texas panhandle with Oklahoma. Most of the west generally has hot, dry summers with an occasional, rather rare flash-flood thunderstorms. In recent years, the west’s winters have been dry with infrequent storms, hence the incessant California drought. I landed in one of the two thin slivers of the west coast’s unique growing climates. The Californian Mediterranean coast is hot and dry similar to the rest of the west, but gets moderated by the Pacific Ocean bringing in the moist oceanic air, but never freezing temperatures. The Pacific Northwest’s maritime climate in Seattle is home to warm, dry summer days and cool summer nights. Winters are a different story, hence, “It rains all the time!” Being so far north the angle of the sun is shallow and our winters are punctuated by dark and dreary days and continuous rains. (Okay, maybe I exaggerate the continuous rains, but that’s what we want you to believe.) The benefit is the wet days fill the Cascade Mountains, just a one-hour drive east of Seattle, with snow, thereby replenishing and storing our summer water supply. With a brand new growing climate, I had to learn again how to grow great food! Seattle’s maritime growing climate is like a symphony, with the temperature modulations ebbing, flowing and moderating as each season progresses with fewer extremes and changing over a period of days rather than hours. 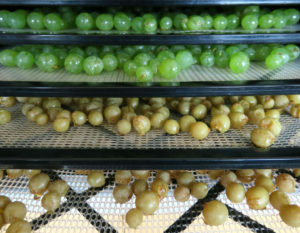 My east coast sensibilities had been used to the mid-May growing season being like the 4th of July fireworks–coming fast and furious with a quick rise from cool spring temperatures to scorching, humid days. To grow food in the Seattle it’s still an educated guess to predict when the spring rains and cool temperatures will stop, or whether our summer will be bone dry and require endless irrigation. Or will we have the year of the “green tomato” with summer daytime temperatures never exceeding 70 degrees? Thankfully, this summer’s weather has been cooperative and my garden is plentiful. 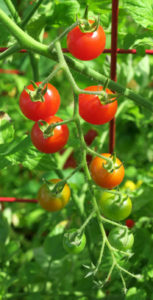 Green pole beans and tomatoes are paired with zucchini, basil, thyme and parsley. I grow garlic and lots of it–both hardneck and softneck varieties. It’s easy. Plant in October, cut the scapes in May for stir fry dishes and harvest in June, repeat. 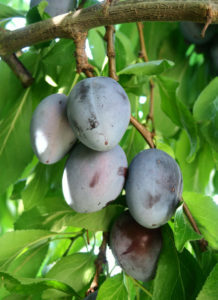 My sole Italian prune plum tree bore 180 pounds of fruit. Bags of cut-up plums fill my freezer, Zwetchendatschi–my grandmother’s Bavarian plum cake recipe–is always a treat, honey-syrup canned plums fill my cupboards and I gave 15 pounds of plums each to two of my favorite local food establishments–Sand Point Grill and Cereal Box Bakery. Four blueberry bushes, close to barren this year, an established rhubarb plant, and a vigorous, logarithmically, increasingly producing Interlaken white seedless table grape round out my garden. Growing my own food makes me happy, tastes good and keeps me engaged with nature. As much as possible, I purchase the rest of my food from local farmers at Farmer’s Markets, PCC Natural Markets and Metropolitan Market. Even so, I’m starting to think when can I slow down? Forty year of gardening is getting close to enough and I’m interested in letting someone else grow my food. Where can I live so I can get produce as fresh as what I can grow? Thankfully, a new type of food-growing residential developments called agri-hoods are just beginning to sprout across the nation. In Washington state, Elk Run Farm and Skokomish Farms are two such communities where a farm is integrated into the development. Elk Run Farm replaced a section of an abandoned golf course with a 4-1/2 acre farm, while Skokomish Farms has a large farm serving 20 homesites on 750 acres. When will the next community builder (aka developer) create an agri-hood for those who crave it? This entry was posted in Agrihoods, Local Food, Urban Farming and tagged Cereal Box Bakery, Elk Run Farm, Sand Point Grill, Skokomish Farms by Kathryn Gardow. Bookmark the permalink.